When a family owned ski lodge is sold to a hotel conglomerate, a driven hotel executive must decide if she should follow the company orders to transform the lodge into a modern winter hot spot, or embrace her newfound holiday spirit and keep its Christmas traditions alive. Would like to see a sequel to this, this is an awesome movie. “Let It Snow” is now available for DVD pre-order on Amazon, and is going to be released in December – http://www.amazon.com/gp/product/B015OVC1H4?keywords=Let%20it%20snow&qid=1443829218&ref_=sr_1_4&s=movies-tv&sr=1-4. I want to know when I can buy this on DVD cause this movie is very good. I just love Candace Cameron Bure cause she endearing person so sweet. I just recieved an update for the movie “Let It Snow”. All it was was when it aired on tv in Nov. Excuse me but it is now January 2015 not November 2014.
looking for Let It Snow DVD. When is it in the stores. When will this movie be sold on DVD? This movie has got to come out on DVD at some point — I hope! I can’t figure out why Hallmark releases some movies on DVD, but not others. I’ve seen many people refer to “Let it Snow” as one of their favorites of all the Hallmark Christmas movies, and yet other people have described it as boring, dull, etc. I fall into the former category and not the latter. This movie was charming. Yes, it follows a similar theme and formula that many other TV Christmas movies (on any channel) follow, but it’s a formula that works well here. Yes, you know how everything is going to turn out at the end of the movie — no real twists and turns — but that predictability is not off-putting. Candace Cameron Bure is endearing as the girl who hasn’t learned to love Christmas (yet). The lodge — and all of its holiday traditions — is enchanting. The people who run the lodge just seem like the kind of folks you’d want to spend the holidays with. This is a movie that left me with a smile on my face when it was over. When will Let It Snow DVD be released? I’ve been checking every month to see if it is out to purchase. Am anxious to buy it. Please notify me when available. Thanks! Would love to purchase this movie on DVD!!! Please notify me when available. Thank You. Went will this movie be available for sale. When will this one go to DVD so I can purchase? I can hardly wait! Has become one of my all time favorites! 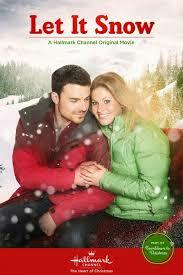 Would love to purchase the movie “Let It Snow” when available for sale. One of the best Christmas movie I have seen in a long time. Brady and Stephanie were outstanding in their roles. Would love to see a follow up of this movie, of course, with the same cast.